Because women no longer stay in the kitchen and cook lunch and dinner for their hardworking men, women need Chippewa boots as tough as a man's for the same hard working jobs. Chippewa knew that when women entered the inner sanctions of stereotypical male jobs, they ... (see full details) (see specifications) #CHPL73050. Because women no longer stay in the kitchen and cook lunch and dinner for their hardworking men, women need Chippewa boots as tough as a man's for the same hard working jobs. Chippewa knew that when women entered the inner sanctions of stereotypical male jobs, they would need women's boots designed just for them that are functional, safe, and comfortable. So Chippewa designed the Chippewa Women's L73050 Waterproof Insulated Safety Toe EH Logger Boots and similar fashions. Featuring black oiled waterproof leather uppers, this footwear is great for all types of weather and outdoor environments. They're tough and durable. The Goodyear leather Welt construction is the most durable construction and easy to repair if necessary. The Vibram Tacoma Yellow Plug Logger outsoles are designed for the rugged performance you'll need when working outside. They can take whatever the ground puts in front of them. Even the brass hardware is non-tarnishable. These logger shoes don't slack on comfort just to make them last either. The heavy duty waxed Sta-Tied laces repel water, while the Chip-A-Tex waterproof booties inside won't allow moisture to permeate onto your skin or soak your socks. The steel shanks offer superior arch support and the brushed Ruby Nylex lining wicks moisture away from your skin. There are 4 iron rubber/ 6 iron robus combination midsoles to provides shock-absorption. And the removable cushioned orthotic Texon insoles give you moisture-control, anti-microbial prevention of bacteria growth and maximum comfort. Meanwhile, 400 grams of 3M Thinsulate Ultra insulation helps keep those extremities warm. 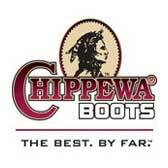 Chippewa knows steel toe boots and they know what working women need on the job. Comfort, safety, and durability is what the Chippewa Women's L73050 Waterproof Insulated Safety Toe EH Boots were designed for, and they pass every test with flying colors. My husband ordered these for me when my new job required safety steel toes. He wears the mens style daily and said that I would never find a more comfortable, longlasting boot. He was right! There is no discomfort from the steel toe and my feet do not hurt after a long day on them. I've had many women ask where I purchased them. These boots look cool and feel great. I will always own a pair! Many thanks for your efforts, and those of your staff. I believe we spoke about ten days ago, when I called into the store to try and speak to a live person. You quickly got me pointed in the right direction and shortly thereafter, I was contacted by your staff and the matter handled. Of late, we have been dealing with numerous firms who have no one on staff, that appears to care about even the basics of customer service let alone, following through. This is clearly NOT the case with your company. I see your signature and title at the bottom of the message just received. Thank you for leading from the top, you have earned a customer for life! Thank you again! Chippewa Boots: Women's Waterproof L73050 Steel Toe EH Black Work Boots is being added to your cart.